Our eagle eyes are always on high alert when it comes to ways that we can save on some of our favorite beauty products, no matter what the source may be. And while we may think of Costco as a place to get toilet paper in bulk and snack on free food samples, they’ve seriously got their beauty game on lock, and we’ve compiled a list of beauty products you should add to your Costco cart. Whether you’re looking for makeup or skin care products, Costco’s got you covered. Their prices are just as great as the rest of the products they supply, so you don’t have to worry about spending more than you’d like. If anything, it’s the perfect way to try out some fancy or new-to-you products without having to worry about breaking the bank. Here are 17 beauty products we’re adding to our basket (along with Costco’s free food samples). 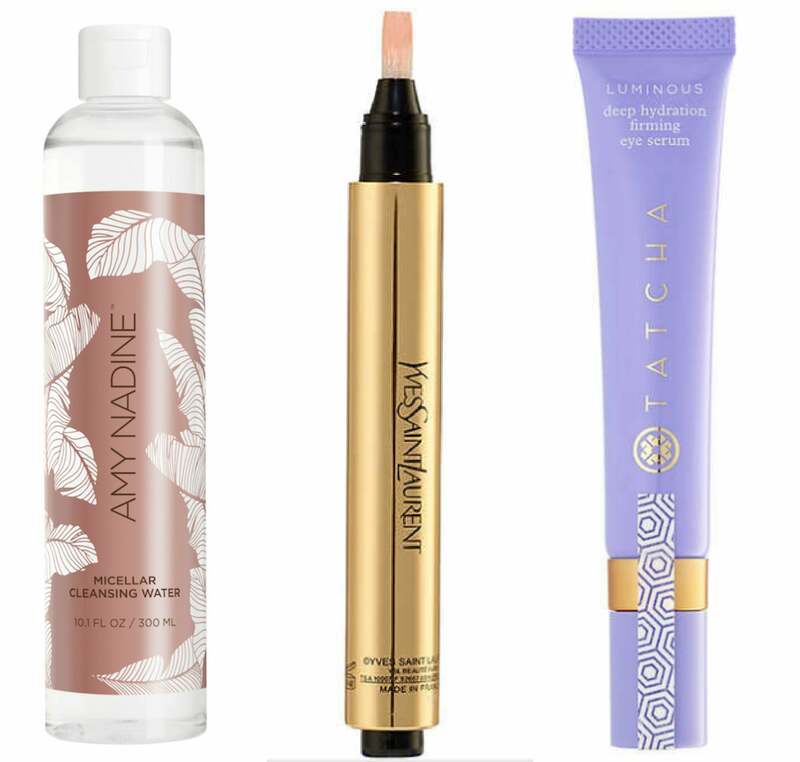 Micellar water is all the rage, and this three-in-one cleansing water was created by celebrity makeup artist Amy Nadine. It not only washes off your makeup along with dirt, but it also tones your skin with antioxidant-rich white tea and replenishing coconut water. This serum can be used on its own or as a base for eyeshadow. It enhances and brightens your eyelid area while blending beautifully. We’re all itching for longer lashes and fuller brows, and this serum promises to help us get there. This is a total steal for the two products, and we have a feeling you’ll love the results. If you haven’t already tried this cult-fave, now is your chance. This gorgeous pen conceals, brightens, illuminates, and highlights, leaving your skin gorgeous and perfectly blended. You’ll never be without your SPF thanks to this creamy CC cream that also improves fine lines and wrinkles, evens out your complexion, brightens, and moisturizes your skin. This bronzer contains two delicate shades that blend to give you a seamless, lit-from-within glow and just so happen to be housed in some truly gorgeous packaging. Chanel is French-chic personified, and this rich, anti-aging, wrinkle-busting, lifting, and firming cream is as luxe as it gets. This fast-acting formula intensely hydrates and soothes skin, delivering a cooling effect while enriching your skin with essential vitamins and nutrients. Specifically formulated for the delicate under-eye, this serum hydrates and firms that tender skin while also reducing shadows, puffiness, and fine lines. This miracle-worker is made with all natural ingredients and is perfect for all your multi-purpose skin care needs. It’s great for scars, dry skin, wrinkles, cracked cuticles, and more. Throw out your vaseline and petrolatum-based products and replace it with this. This moisturizer reached cult-fave status years ago, and if there’s anyone we can trust with a moisturizer, it’s our French compatriots. You’ll be delighted by how blendable and seamless this full coverage concealer looks on your skin. You can’t go wrong with Laura Mercier, and this oil-free formula will give you a flawless, natural finish. A beautiful white floral and fruity scent that is perfect for summer and those crisp fall days that are just around the corner. Featuring base, lid, and liner shades, this palette also comes with a handy little brush, and thanks to the mix of finishes, it’s perfect for going from day to night. This duo sculpts and defines to create natural-looking contours, thanks to its creamy and ultra-blendable formula. Each kit contains two lip colors and a B’lighter in Preacher’s Daughter. It couldn’t be easier to customize your set and pick the lip colors that are perfect for your skin tone. Another French cult beauty brand you can count on, this serum firms, reduces wrinkles, rejuvenates, and moisturizes skin. You can’t go wrong with any of these choices, and it doesn’t get much more convenient than Costco. We’re already planning our next Costco run: beauty shopping, followed by a huge food court churro.